This optins allows the user to choose the parameters for PDF Creation during the application execution. 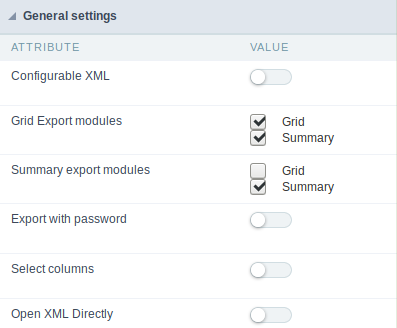 This option allows the developer to choose which modules are available in the grid export. 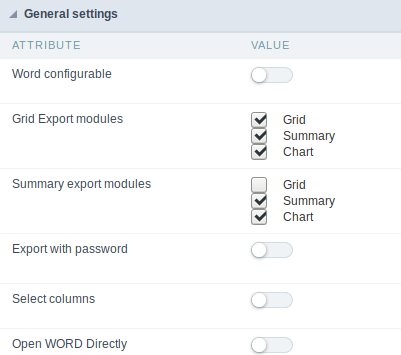 The options are marked for export, however the user can change the modules at run time. 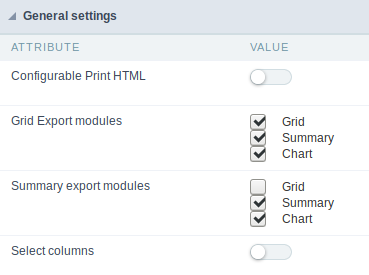 This option allows the developer to choose which modules are available in the summary export. 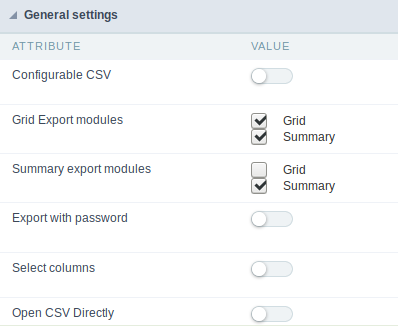 The options are marked for export, however the user can change the modules at run time. Allows the developer to set a password that will be requested when the file is exported. 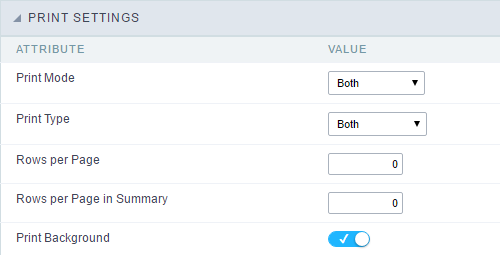 It allows the user has the option to choose which columns will be part of the export at runtime. Open the generated PDF file without creating an intermediary page with a link to it. Option available only when the option “Create Charts” is disabled. This option allows the end user to set up what grouping level will jump page in PDF generated. Allows you to set whether to print in Portrait or Landscape orientation. Allows you to define the type of form in which the PDF will be printed (letter, A4, etc). Allows you to set whether the print mode will be colored or economical. Applies only to horizontally aligned Grids. It allows you to define the number of records that will be printed per page. Lets you define the number of records that will be printed per page in the summary pdf. Complete with (empty) lines until the footer. 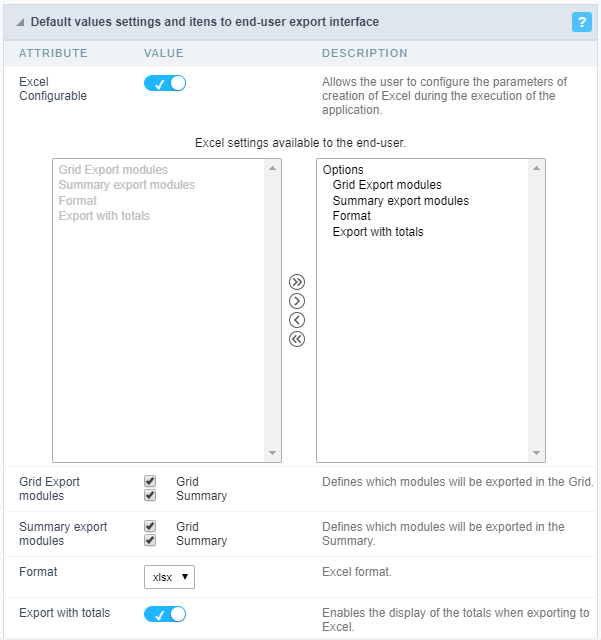 Enable one option in the exportation settings in execution time that allow the user to decide the depth of the group by that will be generated from the exportation. Allows the end user to define until break level will skip page in the generated PDF. Allows the user to configure the PDF creation parameters during the execution of the application. Opens the generated PDF file without the need to display an intermediate page with a link to the file. Generate bookmarks automatically, bookmarks will be generated relative to the Groupby. Numbering format of the page will be simple (1,2,3,4,5, …), Full (1 / n, 2 / n, 3 / n, …) or not use numbering. Allows you to align the numbering vertically, at the top or bottom of the page. Allows horizontal alignment of page numbering (Left, Center, Right). The value in millimeters to be applied in the PDF margins (Up, Down, Right, Left) must be filled in. 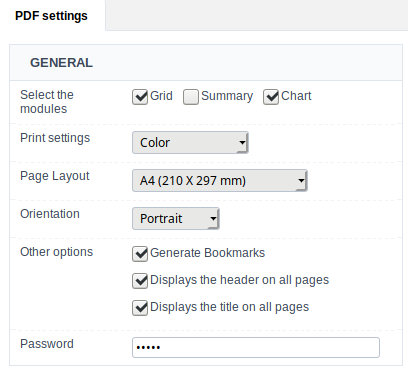 Allows you to print a background in the PDF file. Maximum time (in seconds) of server waiting when running JS. 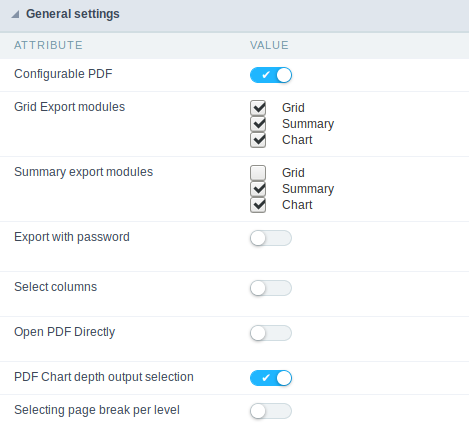 Allows you to define whether the Charts of the application will be displayed in the PDF. The title of the group will be displayed always in the begin of each grouping. Allow that the header be displayed even if is not enabled in the grid. Allow to display the title in all the PDF pages. Allows the user to configure the creation parameters of the document during the execution of the application. This option open the generated WORD file without creating an intermediary page with a link to it. Allows you to set the file’s print mode (Both, Black and White, Colored). Allows you to set the number of lines per page of the Grid that will be displayed in the file. Allows you to set the number of lines per page of the Summary that will be displayed in the file. 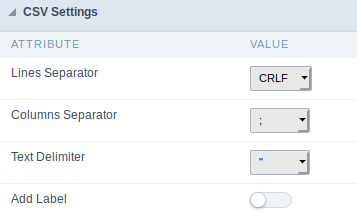 Allows the user to configure the parameters for creating the CSV during the execution of the application. This option open the generated CSV file without creating an intermediary page with a link to it. Allows you to define the separator character of columns and records. Allows you to define the character used to delimit the text of the columns. Allows you to define whether the label of the columns will be added to the file. Allows the user to configure the parameters of creation of XLS during the execution of the application. This option open the generated XLS file without creating an intermediary page with a link to it. Allows defining the XLS format of the generated document ( xls or xls ). Allows the user to configure the XML creation parameters during the execution of the application. This option open the generated XML file without creating an intermediary page with a link to it. Determines whether the XML file will fill valies in attributes or new elements. ( Attr ou Tag ). Allows the user to configure the printing HTML creation parameters during the execution of the application. Allows to choose what content will be printed. ( Current Page or Full Report ). Define the file print mode. (Black & White or Color). Allows define the Grid rows per page quantity that will be showed in the file. Allows define the Summary rows per page quantity that will be showed in the file. Allows to display the background in a HTML form. 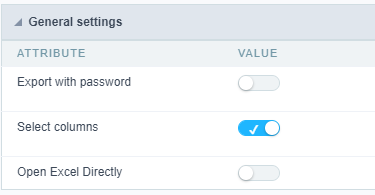 This option enables an option in the application generated to allow if the user can choose the fields that will be exported. This option open the generated RTF file without creating an intermediary page with a link to it.